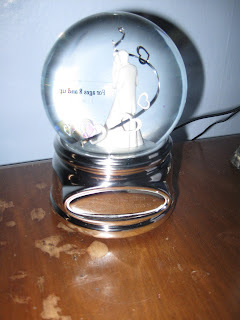 This is one of the musical globe that we got from our wedding reception. And I do love it so much that I even place it on my table beside our bed. Jeff's co-worker from pizza hut gave this to me, not thinking that I really love it. 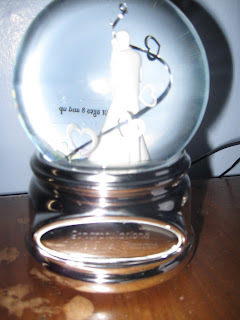 In my entire life I have never got a gift that is musical and this is the very first time I got it. A man and Woman dancing on the musical music with hearts and confetti's that floats whenever they dance. Isn't that very romantic? nice sya.. kumusta naman ka? kanus-a emo due? i was reading the comment up, are you preggy pala?